※Tokyo Metropolitan Library retains all rights related to the above image and prohibits reproduction or secondary use of the data without permission. In 1872, Miyamoto's founder turned himself from selling Copper Boilers to Bugles. In 1863, there was a weapons manufacturing plant of the former shogunate in Sekiguchi-cho, Koishikawa and the Meiji government founded an army in 1872 (Meiji 5th). When shifting itself into a modern western-style army, it began to make foreign-style bugles for signals under the instruction of commanders invited from France and Germany. Our founder, Katsunosuke Miyamoto, who happened to be running copper boiler (copper oven) shop, began to make bugles after he was hired by an officer in charge of military bugle production. 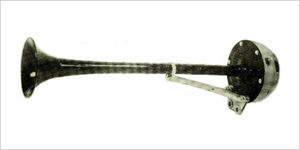 This bugle was used by horse cars in cities around 1882. In Hokkaido, mailmen used it to scare off bears. In 1903, streetcars started operating, and the bugle started to be used as tofu-seller's cry in local areas. 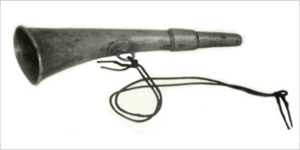 The bugle was manufactured under the name of "Miyamoto Rappa Seisakujo (Miyamoto Bugle Factory)". 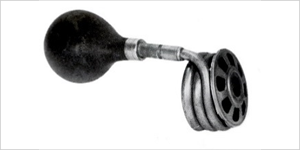 From the late Meiji era to the Taisho era, Miyamoto began to make car horns. 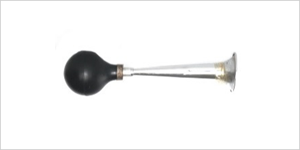 Around 1905, Miyamoto was asked to repair a motorcycle horn, which led Miyamoto to begin manufacturing traffic horns. At that time, Japan started to import automobiles, and Miyamoto started receiving orders for the production and repair of horns. The installation of a friction screw press improved production efficiency than manual operation and Miyamoto embarked on exporting. The thick tubes of these horns were wound in duplex with a reed inside and blown by air supplied from a rubber syringe. These are the products of British manufacturer, Lucas, and thus named accordingly. 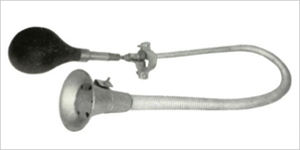 This straight-line bugle was attached to the windshield of French Citroen cars and called 'simple bugle' due to its simple structure. "Boa" means a large snake; in the mid-Taisho era, the long body of this horn was used for decoration as it was laid on a fender (mudguard) like a snake. 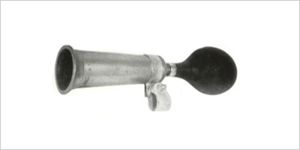 From the early Showa era to the end of World War II, Miyamoto began to manufacture electric horns. 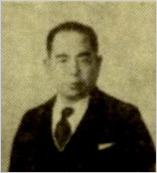 Around 1931 (Showa 6th), Miyamoto began to manufacture Japan's first electric horns, but faced a shortage of goods and materials as the war expanded. The annual production of electric horns around that time was approx. 6000 to 7000 pcs. The number of employees dropped to under 20 due to the draft and relocation. 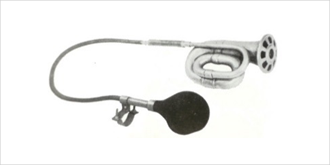 Due to the wartime control of materials around 1940, Miyamoto became the only company manufacturing air horns until the defeat of the war in 1945. When the war ended, Miyamoto stopped producing air horns. In March of 1945, Miyamoto's factory in Edogawa was entirely destroyed by the Great Tokyo Air Raids. Used for military and standard vehicles, sold under the name of "TONHON". 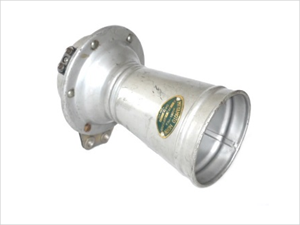 In 1954, the company restarted business with the trade name of MIYAMOTO ELECTRIC HORN CO., LTD. Since then, Miyamoto has been manufacturing a wide range of products while achieving cost reduction and improving quality. This bugle was used for passenger vehicles and trucks from 1952. 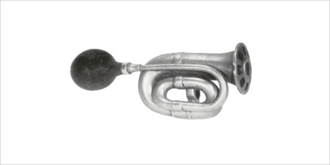 This two-tone colored bugle, having different colors on its rear cover and tube, was exported to South East Asia and gained popularity. "A person who only focuses on and pursues their own interests and profits is not qualified for running a company. In this world, happiness and peace for individuals and the society can be maintained by people considering public interests, and the world seems to be moving toward that direction."